Dementia Australia (Qld) provides free one-on-one counselling sessions for people affected by a diagnosis of dementia, including the person with dementia, their families and carers. Depending on your location, appointments are available either by telephone or face to face. Telephone counselling sessions are available between 9am and 4pm Monday to Friday. 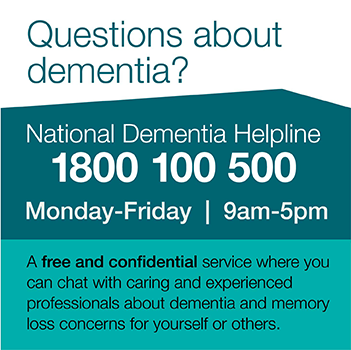 To book a time for a telephone counselling session please call our free National Dementia Helpline on 1800 100 500. Helping to obtain appropriate services or practical assistance. The National Dementia Helpline can also assist you with information and advice about memory loss, dementia and good brain health.